The Kingdom was at peace, both within its borders and with the neighboring lands. Prosperity and opportunity was in abundance and many claimed it was a new golden age. But within the castle, the prince of the now old King looked out upon the land and felt nothing but hate in his heart. He saw a land full of lazy, fat people who would be easy to rule. All he needed was power and he was willing to do whatever it took to claim it. But there was news of Heroes who had recently entered the castle gates. Would they prove to be a problem or nothing more than an annoying distraction? 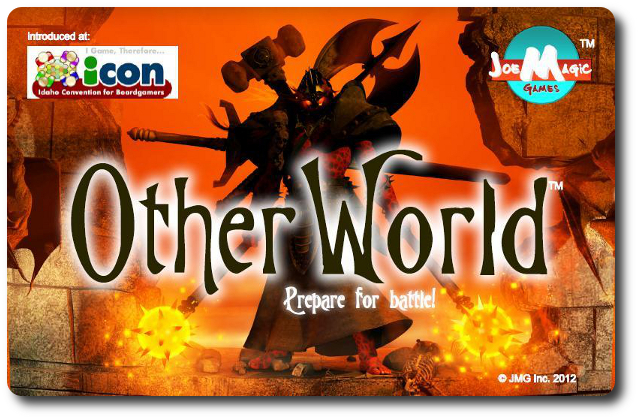 Other World, by Joe Magic Games, is comprised of 1 Evil Prince pawn, 5 Character pawns, 8 six-sided dice (4 red, 4 blue), 20 Gold tokens (yellow chips), 12 Basic Weapons (white chips), 15 Wound tokens (black chips), 25 Victory Point tokens (blue chips), 15 Character cubes (in 5 different color sets, 3 cubes in each set), 6 Advancement tokens (squares), 12 Creature cards, 10 Character cards (9 characters, 1 Evil Prince/Prison), 26 Weapon/Spell cards, 1 Village board, and 1 Catacombs board. To set up the game, first unfold the Village and the Catacombs boards, setting them side-by-side. These two boards should be placed in the middle of the playing area. Then each player selects a Character pawn and takes the 3 Character cubes that match the pawn color selected. Select which player will be the starting player (not First Player) for game set up using the dice or whatever method the players agree on. The starting player will find and set aside the Evil Prince card, placing it next to the Village board face-up. They will then select which Character they want to play as using the 9 remaining Character cards. 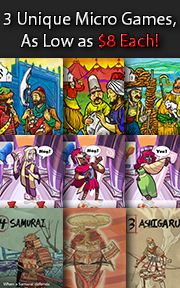 Once selected, they will pass the remaining Character cards to the next player, allowing them to select a Character. This continues until all the players have selected a Character card. The remaining Character cards are removed for the duration of the game and only used again if a player looses their Character in battle. Shuffle the Weapon/Spell cards and place a Weapon/Spell card on each of the spaces on the top row in the Village, face-up. Then place 1 Weapon/Card card in each of the spaces in the 2nd (middle) level of the Catacombs, face-up. Place the remaining Weapon/Spell cards off to the side and kept face-down. Shuffle the Creature deck and place a Creature card on each of the Catacomb spaces, face-up, starting with the first level of the Catacombs, followed by the 2nd level and then the 3rd level. The colored chips used in the game should be separated into different piles and placed within easy reach of all players. Optionally, one player can be the “Banker” and handle all the chip transactions. Regardless of the method used, each player will now receive their Character’s starting chips as identified on the Character card. Now place 1 yellow chip on each of the Creatures located on the 1st (top) level of the Catacombs and 2 yellow chips on the Creatures in the 2nd (middle) level of the Catacombs. Count out 5 Victory Point tokens for each player and remove the rest from the game. Place counted out Victory Point tokens to the side of the boards. The last player who selected a Character card is now the First Player and the game begins. Note: Other World is a pretty big game for such a small box. As a result, we will only highlight and summarize the game and the game play in this review. The players will each have one Character they will use during the game. The Character can equip an unlimited number of Weapon/Spell cards, but does not necessarily have the ability to use all of them fully. On each Character card is a Weapon Skill value and a Spell Skill value. The Weapons/Spell cards also have a value for the weapon and the spell on it. If the Character’s skill level is equal to or higher than the matching weapon or spell on the Weapon/Spell card, it can be used by the Character. Each weapon and skill on the cards that can be used by the Character can only be used once during combat, but are never lost as a result. The number of weapons and skills the player can activate during combat is defined by the Character’s lowest skill value. For example, if a Character’s lowest skill value is a “3”, that means the player can only activate 3 weapons or spells that have a value lower than or equal to the matching Weapon or Spell Skill on the Character card. If this sounds limiting, it is, but this limitation can be removed by visiting the King. If the player has at least 1 Victory Point token, they can gain an Advancement token that adds +1 to both the Weapon and Spell skill. The player can again raise their limit by visiting the King when they have 3 Victory Point tokens, adding another Advancement token, and then 5 Victory Point tokens for their third and last Advancement token. The game is played on two game boards. The first is the Village and has specific locations the players will visit to complete actions. The second is the Catacombs, the world beneath the Kingdom that is filled with creatures and treasure. For the most part, all combat will take place in the Catacombs. The Village will provide to the players a Smithy (who can make Basic Weapon tokens), a Sorcerer (who will take 3 Basic Weapons and turn it into a random Weapon/Spell card), a Market, ability to spend time with the King’s Army, a Healer, means to gain supplies as well as buying Weapon/Spell cards, as well as a few other actions. The players can even visit the castle and ask the King for favors. But the Village is also home to the Evil Prince and he will walk the streets and alleyways and cause trouble. Wherever the Evil Prince stops, the shops close, and people run to hide. As a result, the player’s will not be able to use the resources of the Village wherever the Evil Prince should be at that moment. Lucky for the players, the Evil Prince has no desire to engage them in open combat and will avoid encountering them. And why would he anyway? He has the ear of the King and will persuade his father to Tax the players when he is in the castle and persuade the Sorcerer to cast a spell of peace that will temporarily cause all the players to flip-over one of their Weapon/Spell cards, making them unusable for the duration of that round. The Catacombs are much less colorful, a whole lot more dangerous, but also more rewarding. Under the Kingdom, the dark Creatures summoned by the Evil Prince, have taken treasure, weapons, and spells from the above world. It is assumed they are gathering them for their master, the Evil Prince, but who knows the hearts and minds of such evil beings? Regardless of their intentions, the players can venture down into the darkness and retrieve the treasure by defeating the Creatures with their wit, might, and magic. What they encounter is based on the player’s choices and where they end their movement when traveling the realm. The player’s Hero will travel about the Village collecting equipment, influence, and supplies to better their chances of victory in the Catacombs and improving their standing with the King. A player’s turn is used to do just this. When it is a player’s turn, they can move their Character pawn to any location in the Village that is not currently occupied by the Evil Prince, another Character Pawn, or the same space they currently occupy. The one exception to this rule is if the player wants to engage in combat with the Evil Prince. If such is the case, then the player moves their Character pawn to the same space as the Evil Prince. The player can also move to the Catacombs from any location in the Village, but they must first start on the first Level. If the space they move to is empty, then they immediately descent to the next level or move within that level following the red arrows that show possible direction. At anytime a Creature occupies a space, the player cannot go past it and must engage the Creature in combat. When exiting the Catacombs, the player may place their Character pawn on any unoccupied location in the Village, but must ascend through the Catacombs to the first level to do so. If the path is blocked by a Creature, they must engage it. If not, they automatically ascend and can be placed on the Village board. If the player is located in the Prison, they can exit to any unoccupied location in the Village or enter the Catacombs once they are released. The Evil Prince also travels and will walk in the Village and the castle. This is done by the First Player (and only the First Player) as their very first action. The Evil Prince pawn will only go to specific spaces with a number on it and only on those spaces that do not have a Character pawn currently placed. The Evil Prince travels from one numbered space to the next, always going to the next highest and available number. Once the Evil Prince has traveled the entire length of the Village, he will return to the castle and start again. That is, of course, unless the Evil Prince meats a bloody end in combat. Use Basic Weapons: the player can spend (discard) 1 white chip to add 1 red (Creature die) or 1 blue (Character die) – the player can spend as many chips as they like but there are only four of each dice – the reason for this will become clear in a moment. Roll Random Red Die: Creatures that have a random die icon on them show how many random red die are rolled – these are rolled and the values are set aside for the moment. 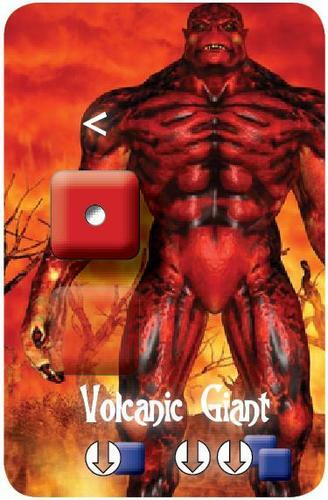 Place Set Red Die: Creatures will have a set (base) red die value – a red die is added to the random die and placed with the number value identified on the Creature card. Roll Extra Dice: depending on where the creatures is located in the Catacombs, extra dice might be added, signifying the growing difficulty of combat and strength of the Creatures the deeper the Character goes. Roll Two Blue Dice: the player now rolls two blue dice and sets these aside – these values represent the Character’s combat strength. Manipulate Dice: now the player has to do some serious thinking – each Creatures as a different victory condition that might require the player to have a rolled value higher than, lower than, or equal to the Creatures value – this is where the extra dice purchased in the first step come into play as well as the Character’s weapons and spells. Once the player has manipulated the die values the best they can, the results of combat are resolved. Depending on the needed victory condition indicated on the Creature, the player will either win the battle or lose. If they win, they can take all the gold or the Weapon/Spell card (if there is a choice). Sometimes a Victory Point token will be won, too, and depending on the Village spaces currently available, additional Victory Point tokens can be won. If the player wins the combat and has enough influence with the King, they can permanently remove the Creature and gain a Victory Point token; otherwise, the Creature remains in the Catacombs! Of course, if the player is unable to win in combat, there are consequences. A player who is defeated in combat receives 1 Wound (black chip). 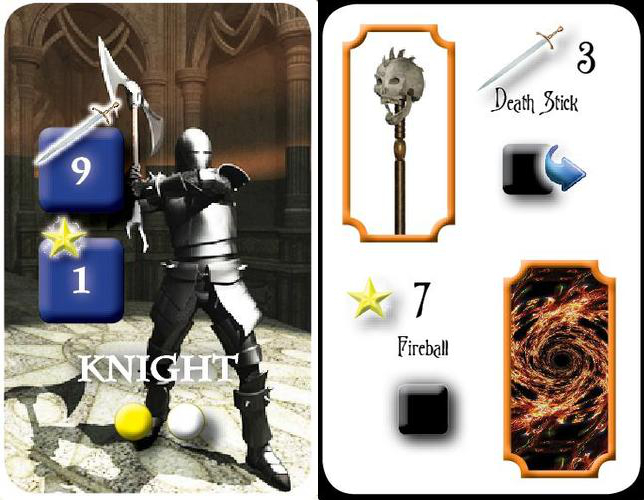 If the player collects 4 Wounds, the Character perishes and all tokens and Weapon/Spell cards are removed, forcing the player to select a new Character card and start over. The player also has the ability to engage the Evil Prince in combat by placing their Character pawn in the same space as the Evil Prince pawn. Combat is played out in the same way it is done in the Catacombs, but the consequences and spoils are a bit different. If the player is victorious, the Evil Prince pawn is removed from the game and the player is awarded one Advancement token. If the player should fail to kill the Evil Prince, they lose an Advancement token. The game ends when all the Victory Points have been claimed by the players. All the Victory Points are now counted and 1 point is reduced for every Wound (black chip) on the character. The player with the most points wins the game! 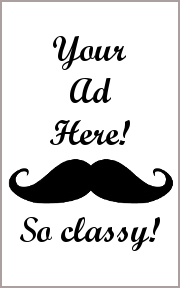 To learn more about Other World, see the publisher’s web site. Just after reading the rules, I can already tell that this is a game above my 4-year-old’s abilities. There is too much strategy and tactics, logical and critical thinking for him to play this game well. The game itself is also fairly “involved” when it comes to game play. The player must constantly be thinking of their “next move” in typical Eurogame fashion. My 7-year-old should be able to handle the game, however, and I don’t think it is beyond his abilities or patience. When I pitched the game, my 4-year-old still wanted to give it a try and I was happy to let him do so. There is zero player interaction and his only impact to the game will be temporarily taking up a place in the Village. This will allow me to help him during his turn without impacting his brother’s game choices. Besides, I’d never say “no” to my little geeks when it comes to games. Teaching the game doesn’t take long as the rules are very straightforward. That is not to say my little geeks didn’t have questions. On the contrary, they were terribly confused. Like a majority of Eurogames and worker placement games, it can be difficult to understand what a player should or should not do until they have a strategy. The game allows for complete player control but provides nothing in the way of signposts to help them on their journey. For Gamer Geeks, this is a wonderful thing, but for little geeks who are still learning games, this is like sending them into a tunnel without a flashlight. Nevertheless, they wanted to try the game and I suggested we “learn as we play”, which they were happy to do. My 7-year-old has had prior experience with more complicated games and not always with positive results. He seems to have either forgotten this or simply doesn’t care. Either way, I’m pushing forward and taking advantage of their enthusiasm! 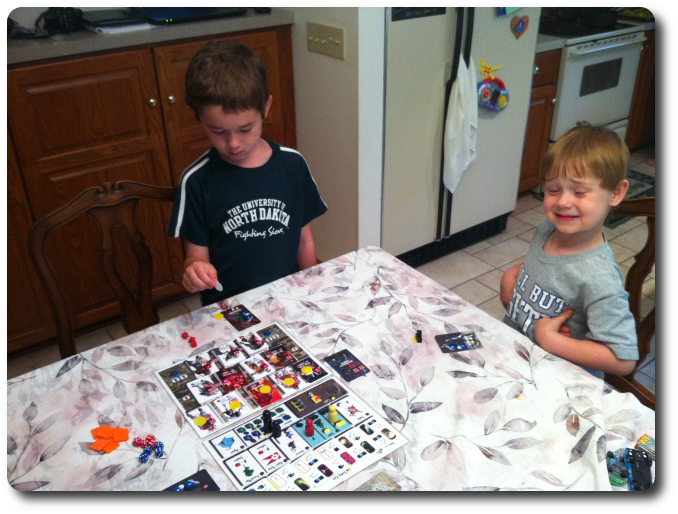 While I set up the game, I asked my little geeks their thoughts on Other World so far. Did I fail to mention that my little geeks have been fighting off and on all day? If so, now you know. Let’s see if we can temper their feud with some wholesome fantasy combat or the game only serves to fuel their bad mood. Other World proved to be much more challenging than I originally believed for my little geeks. The game rules are not terribly difficult, as I have already mentioned, but there are two specific aspects that were just too much for my little geek. The first was combat. My little geeks are used to combat mechanisms where they are always trying to get higher or lower than a specific value. Not the case in Other World. The player has to spend a good deal of energy manipulating dice values which is done by collecting weapons and spells. You have to attempt to equip your character for all types of possible combat challenges. This proved to be too much for my little geeks to grasp fully. The second was the Village. Knowing what to land on and when is very tricky even for adult players who are new to Eurogames. You have to know what you want to do and then do all you can to get on the right place at the right time to meet your goals. This is highly appealing to players who love an excellent logistic, strategic, and tactical challenge, but downright confusing and frustrating to just about everyone else. It all depends on game preference, really. If you are an individual who likes games to provide open possibilities, then Eurogames are where you need to be. If you like a game to have defined paths and clearly marked trails that suggest how you can win the game, then Eurogames should be avoided at all costs. In the end, both my little geeks threw their hands up in the air asking to be done well before the game was finished. As a result, we cannot suggest this game to little geeks any younger than the suggested minimum age as noted by the designer/publisher. Parent Geeks were a terribly mixed bag, with the majority either not liking the game or simply not understanding it. Again, it goes back to what types of games the player is searching for. Players who usually love fantasy themed games just didn’t care for Other World. When I asked them if they liked Eurogames, they answer was usually “no”. So, there you go. Again we see that the player who is not familiar with or doesn’t care for the classic Eurogames mechanisms are not fans of Other World. Gamer Geeks we tested the game with had a wonderful time with the game, with their only criticisms being the game’s component quality and the lack of more Creatures. To address the first criticism, it might help everyone to remember that Joe Magic is small publisher and their component quality is by no means as detailed or as high a quality as bigger game publishing companies, but nor are their prices. Their games cost less, don’t look as pretty, but play like big games. We’ll leave it up to the individual to define what a “quality game” means to them. In regards to the second criticism, I completely agree. More Creatures are needed as there are only enough to fill the Catacombs. This means you will see the same Creatures each time you play the game with only their location in the Catacombs changing. This reduces some of the game replayability. Gamer Geeks, here is a game that mixes worker placement, resource management, area control, and dungeon plunging in a way that is both familiar and new. It has a very strong Eurogame feel and emphasis is placed on building a dynamic Character that has the ability to manipulate dice values using multiple methods. Everything in the Village is a means to an end and the victory condition can be achieved using a number of different tactics and strategies. The game plays pretty light, as far as Eurogames go, but takes sometime to finish. Depending on how aggressive and fast the players are, the game will take less time to complete. Regardless, we think Gamer Geeks will have a good time with Other World and be pleasantly surprised by the game’s depth and challenge. Parent Geeks, unless you like Eurogames, this is not a game you will enjoy. There is zero player interaction and no set strategy. This can make the game difficult to teach to non-gamers and little geeks. If this game is played with the family, we suggest you wait until you’ve cut your little geek’s teeth on easier, less involved Euro-style games or until such time you think they can handle a Eurogame with little difficulty. Child Geeks, this is not a game you’ll be able to play well until you get older (at least 12-years-old) or until you have a significant amount of Eurogame experience. The game will not help you find your way or make a better character. In fact, jumping into this game with little Eurogame experience is a lot like jumping behind the stick of an airplane. If you know how to fly a plane, you won’t have any problems. If you don’t, you’ll get a nosebleed from all the knobs, switches, gauges, and lights in front of you. Simply put, wait on this game for a bit as there is a lot to consider. On a personal note, I found Other World to be an interesting mix of game mechanisms I am already very familiar with. I never felt like I was playing a game that was breaking new ground in its level of complexity or execution, but I did greatly enjoy the theme and how it was interwoven with the game itself. And yes, like most Eurogames, the theme felt pasted on at times, but it worked and worked well. The challenge comes in selecting the right Village space to take and when to advance down into the dungeon. The faster you build up your character in a way that is economical and useful, the faster you win the game. The character “machine” you build will either make you or break you. Get it right and it is terribly rewarding. I enjoyed it and you might to if you are looking for a Eurogame with a fantasy theme with dungeon plunging tied in. Do take a look at Other World and see if it is the game you’ve been searching for! Tagged Gamer Geek Approved. Bookmark the permalink.